We often hear Mary Kay (and other MLMs) compared to normal corporations. This is how they rationalize the pyramid. Those who compare MK to corporate America want you to see the realistic and understandable scenarios of corporate structure and how Mary Kay mirrors the same structure. In many organizations, there are only a few at the top who make the majority of the money. Think CEO, CFO, President, Vice President, heads of departments. Like Mary Kay, thousands of workers make minimum wage while these leaders earn the big dough. The lesson here is that if you work hard, if luck would have it, if the stars align, you might work yourself up to Dept. Head, and someday be a Vice president. Likewise, Mary Kay tells you the same thing. 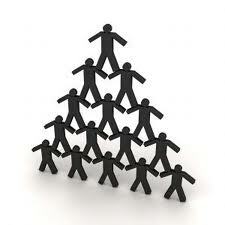 Work hard, and you will make that climb, but even better for you is, the TOP positions are not already filled! You can be a NEW CEO of your own company! The theory is true for sports figures as well. Thousands upon thousands of kids all over America try out for, and play, various sports. How few make it to regional championships..and how few make it to the professional sports leagues? A very few at the top get paid the biggest bucks while the majority of those in the league make much less, and still the majority who play do not make it into a league at all. This is the nature of things. The best rise to the top and get paid the biggest bucks and that is just the plain reality of business in America. That is Mary Kay’s reality as well, they say. You just are having trouble accepting that MK is a corporate structure that rewards the best with the most money, and the best will always be a small percentage. This argument is given to make you come to your senses, you Anti-MK zealots! Except, there is just this one small problem. Does corporate America require employees to buy and stockpile the product that pays the commissions to their CEO? Does the salary of that NBA player depend on all the team members charging refreshment stand product or game tickets to their credit cards? Since when do regular corporations require their employees to turn over their paychecks in order to have their JOB next month? The money to operate regular company comes the usual way: through good and services purchased by consumers. A regular company that required its sales force to purchase the goods and services themselves so they can get a commission and remain with the company would be a huge red flag! Mary Kay’s analogy that it is like all other corporations overlooks one very important thing. The majority of their income is on the shelves and credit cards of their independent sales force. How many Honda employees had to charge the months production at the Honda plant to keep their job? How many NBA stars got their paycheck collecting from the players in the locker room? This is the fraud of MARY KAY and will always be the reason why they will never be a legitimate business. They do not care about, nor to they track, nor do they post, nor do they promote actual retail sales… paying commission on actual retail sales. The figure would be so low, the company would be humiliated and the sales force would pack up and quit. Not even consultants buying for their own use would order $6,000 retail in a year. So the next time you hear the analogy that “Mary Kay is like all other companies, they all operate like a pyramid…” ask your Mary Kay defender if all other companies base their employee paychecks on how much of the company’s product the worker has on his credit card. Then there’s the “MK is small business, not corporate!” version. “If your friend sells A, buy it! If your friend sells B, buy it! and so on with A, B, C, etc. all being MLM companies instead of actual small businesses. If those are small businesses, then so are each of the franchise outlets near my place. More food for thought. It should strike some Mary Kay MLMers as curious that this Mary Kay CFO’s bio has absolutely no mention of being a MK consultant, and working her way up the ladder. You’d think they’d promote their own if they are comparing MLM to a corporation. And gosh, she even went to college. Isn’t that something MLM frowns upon? “Gibbins joined Mary Kay Inc. in 2013 as Chief Financial Officer following a long career of broad leadership experience. Prior to joining the iconic beauty brand, Gibbins spent 17 years at PepsiCo, where she held senior roles within the finance function, including Senior Vice President of Revenue Management at Frito-Lay North America, a multi-billion-dollar convenient foods business unit. Before PepsiCo, Gibbins excelled in a decade-long career at Arthur Andersen LLP, leaving the firm as a senior manager in the audit and consulting practice. Listed Skills and attributes – Professional faker and liar. Good at dressing up like a princess in drag. Soft hands. Big family. Love spending money. High credit card limits. Almost divorced. Notice “our markets” is one category and “MKIBC” is another category, not “the IBC markets” – subtle but telling – IBCs are one of the profit centers for corporate. Return your product and help destroy MK corporate. Putting MK on any resume would be an embarrassment. Lugging useless products around in the trunk of your car like some kind of second rate scam artist certainly wasn’t fun. Dealing with wet facecloths. The never ending costs and absolutely no where to properly advertise. Nothing remotely appealing about being a kaybot. Because of decades of deception women avoid the MK lady like she were a telemarketer. It is 2018 we now have caller ID and the internet. The word is out that MK’s fairy tale of part time work for possible executive income is laughable. The SD’s and even NSD’s constantly go from having a silly pink car to nothing or co pays. It must be demoralizing to be an NSD and realize it won’t be long until many of your directors wake up and quit. Nothing classy about front loading women with product that almost everyone wants. Savvy women know they can count on eBay to buy MK at rock bottom prices. New IBC’s need to stop trusting this mlm and return their product immediately. Go look at #nsdsummit18 on Instagram. No one in corporate America would dress that way or have makeup like theirs. I am so glad I stopped wanting to be an NSD!